It’s a strong idea: Each of us has a mate out there—a perfect mate. A match-made-in-heaven. Most people think of their “soul” as the essential, non-visible, real-me part of themselves. So in the soul mate scenario, two of these meant-to-be entities would magically connect, harmonize, and illumine the cosmos around them. I get the idea of a soul mate. We want to think that either (1) we are with our soul mate right now, or (2) there is a soul mate “out there” for me somewhere (and that idea keeps me going). 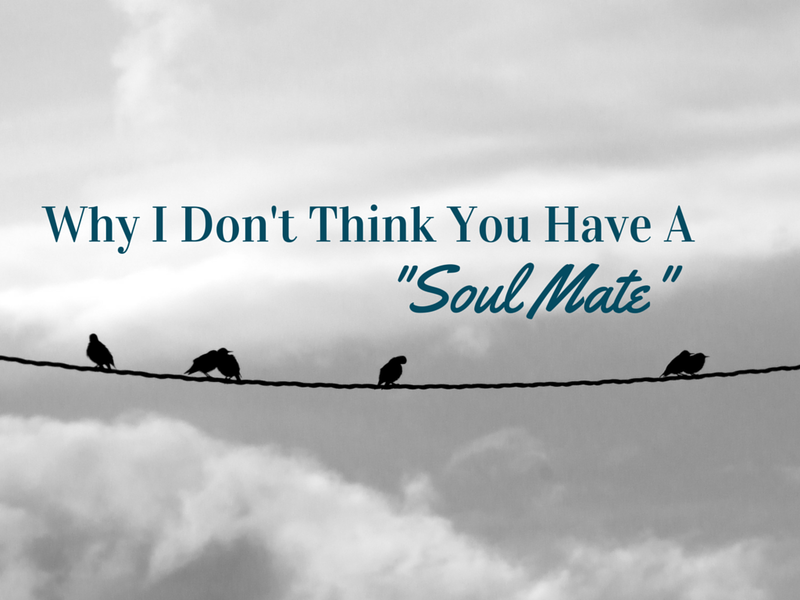 Here’s why I don’t think you or I have a soul mate. Love is a choice. It’s an act of will. So it must be love! Maybe. It could also be hormones. Or novelty. Or laziness. The metaphor “falling in love” makes it seem like the whole project is a hole in a field somewhere. And after you fall you’re stuck in the muck with no ladder. In his latest book called All The Places to Go: How Will You Know, Presbyterian writer John Ortberg talks about how God puts open doors before us. How do we know which one to go through? How do we know which decision to make? And although there is definite wisdom about which doors to avoid, and which doors to walk toward, quite often it is more about how you go through the doors in your life. It’s not just what you decide to do, it’s how you decide what you decide to do. It's not just what you decide to do, it's HOW you decide what you decide to do. It’s about character. It’s about making intentional choices. Love is not a superficial get-along-at-all-costs project. It is a build-the-other-up project. And that includes honesty and accountability. You’re a partnership, yes. But you’re still individuals too. The biblical writers talk a lot about family and values and priorities. But Jesus was single. So was the apostle Paul. Marriage isn’t for everyone. In fact, Jesus said (in three out of four gospels) that his true family wasn’t biological: It was those who did God’s will. So no. I don’t think you have a soul mate. I get the idea. But I think it’s a cop-out of the hard-yet-joyful work of a true love relationship. I don’t think soul mates exist. It is a conscious choice every single day. A choice to choose the one you’re with. It is praying for one another. It is an act of will. It is deciding to love even when the feeling of love is lacking. It is being each other’s best critics. It is being individuals, so that the “winds of the heavens” might dance between you. It is living your vows as a two-person mission project. It is seeking the best for the other person. May we know, as best we can, what love is—true love. And choose it. And pursue it. I think the term soul mate is misconstrued. I think soul mates come in many forms, and not just the romantical variety. Parents, friends, teachers, whomever. Because the primary job of a soul mate is to help us identify that which is inside us that needs to become more. They tear down our walls, force us to see ourselves as we truly are and what we truly could be. It isn’t about loving the same movies or feeling lust or romantic love. It’s about challenging us to become what we are intended to be. And without that, what would be the point of just going through life without any growth or someone to help us raise ourselves into something more? Thanks for your comment; I like the perspective of someone “challenging us to become what we are intended to be.” Thanks! I fell in love when I was 18 years old and I loved the same man for 54 years. I still love him, although he died eight years ago. Beside my computer is a card he signed saying “For all you are, and say and do, I love you very much.” We built a life together, full of decades of triumphs and tragedies, heart attacks and cancer, no money, and some money but falling in love was just the beginning of the adventure. That love grew into a deep trust that the other person would be there for a lifetime…and he was. I believe that the fact we were both Christians was the best foundation we had…I may not have understood football, but when we went to the games together, I loved his enthusiasm…and he patiently sat through some chick flicks with me. When I look at his photo on the dresser I still feel the same attraction I felt for him when I was 18 years old. I really like this post. I recently got married 2 months ago, and I have found great joy in realizing that love is a choice and an act of my will, not a fuzzy feeling I get when I’m around my wife! I did have an emotional feeling at first, but those times are limited! Now I must draw my strength and love from Christ, to CHOOSE to love her with!! Hi Jarrett, In terms of your recent wedding, congratulations! And with respect to your comment, I would totally agree! Thanks for sharing that.